When in Montreal this spring, my aunt noted that I must really like this red and white tunic I made from the August 2008 issue of Burda. Yes, yes I do. I wear it on all vacations, every PR weekend I’ve ever attended and with regularity each summer. It’s one of the perils of making most of your own clothes. You have a smaller stable to wear and you wear the heck out o the things you like best. After two years, I finally made another version for fall. 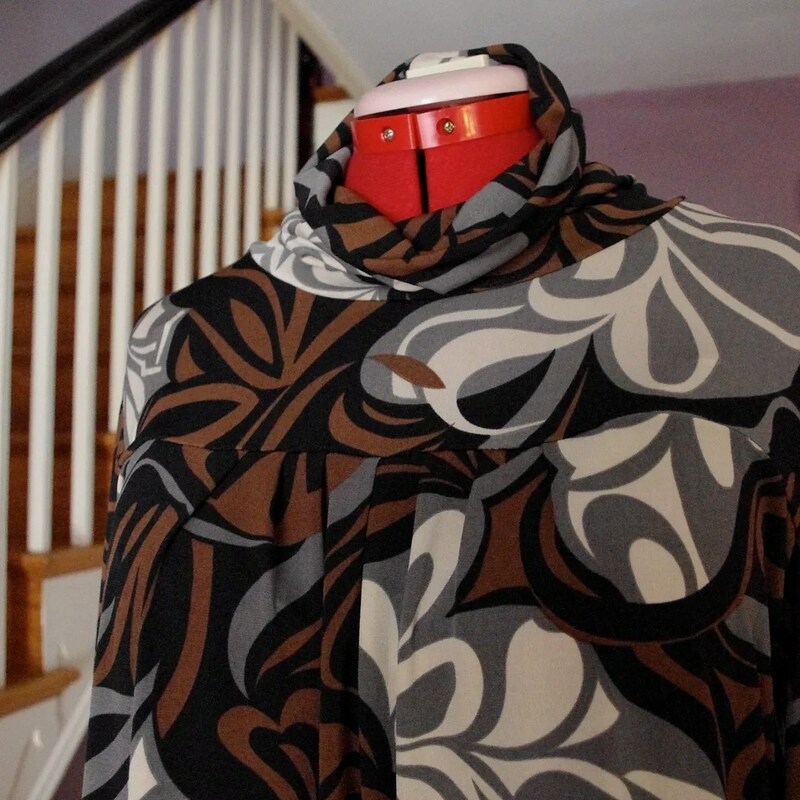 This time from a black, brown and grey knit I picked up in Philadelphia with Trena and Karen last October. This time, I added the sleeve from the 9-2010-121 turtleneck I made last week and added four inches at the skirt hem so it was office appropriate. Hmmm. Still a hair short for work. But, whatev. I made this on Friday evening in about two hours. It’s entirely constructed on my serger. My favorite feature are the tucks along the front yoke. They are often lost in my busy prints. The gathers also make for quite the boobilicious dress. Trust. I’ve had many a man distracted when wearing. I’ve mentioned before that I don’t like hemming knits, but I had the twin needle already set up for the leotard that I went ahead and did it anyway. I must say, Ann’s posts on knits from a few years ago really changed the way I worked with them. Christina also got me to buy this roll of knit fusible interfacing (Portland or LA. I think Portland). I use it along the hems of my knits so they are nice and stable. Clearly, I’ve gone knit crazy now that my serger is back. Last night I cut out two more knit tops and have two purchased tee shirts I plan on refashioning. Very cute dress! You look GREAT in a wide belt! Well, it sure does look good on you (the dress you wear on vacation) and I like your newest dress, too. In your recent post about leotards, I was quite impressed with your use of the elasticator on your serger. When I bought my serger, they gave me a box of feet that I have never even opened. I bet I have one. I shall give it a try. Love your dress. 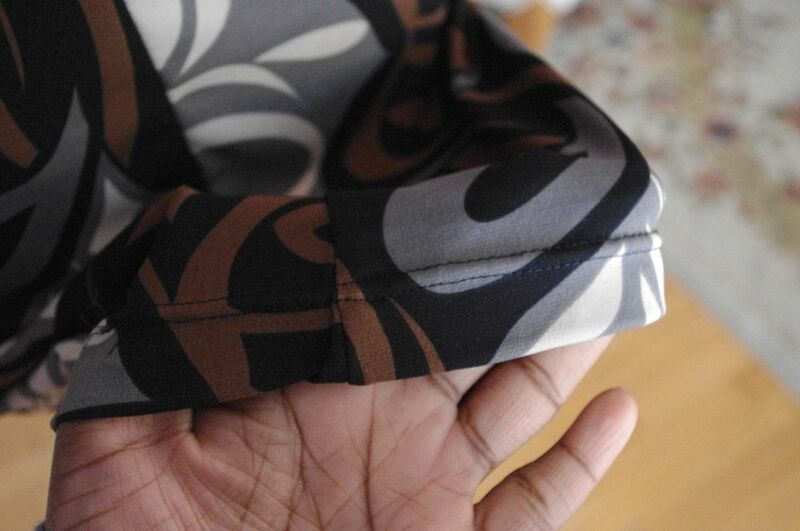 Question – does that interfacing still retain some stretch in the hem? And I suppose it keeps the hem from stretching out while you’re stitching with the twin needle? May-be that’s what I needed to tame the hem on the latest less-than-perfect attempt in knits! For me, it helps precent tunneling between the twin needle stitches. It’s a little stretchy, but not as much. 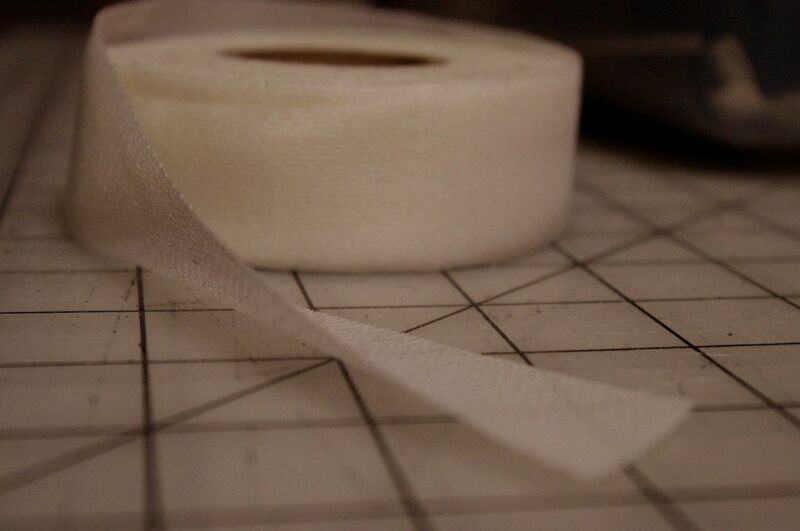 I don’t tend to use it on hems that need to retain a lot of stretchiness. It’s also seems easier (to me) to prevent the fabric from sliding so to speak when I stitching down the hem. Great dress! I’ve got this pattern paired with some hot pink and black houndstooth – just have to get around to it. It’s such a fun look. Ooh, love the fabric on this one too. Love the dress and the fabric. I was in Philly too but I missed that great print!!! I guess I’ll have to start stabilizing my knit hems as well. At least until I get a Coverstitch machine whenever that may be. Cute dress! I like it with the tights. I’m still sworn off knits but you’re doing a fantastic job here. Love the last pensive pose! The dress looks great. It is the perfect color combintation for your complextion, too. I like it with the tights, but I could see it with a brown or dark beige (?) color tights too, and a pair of boots. OK. I will shut up now on the wardrobe styling! I think what you’ve made it really versitle and you’ll get lots of wear from it, too. I love your dress! Oh how I wish Burda would put up the older patterns on their site. I see these great dresses on the blogs and want to make them but can’t get the pattern! Bah! And the print is just great, too! I just want one! Love your blog, btw, I read faithfully (and the blogs of several of your commenters, too). I hope to sew as well someday! I really like this one. I think it looks perfectly office appropriate. I think opaque tights can make a lot of things work for the office when it could go either way. I’m loving the print and the dress especially with the gray tights! I love your dress and the tights are great too! Cute dress! It looks great with tights. I don’t think it’s too short for you to wear to work–on most days, anyway. 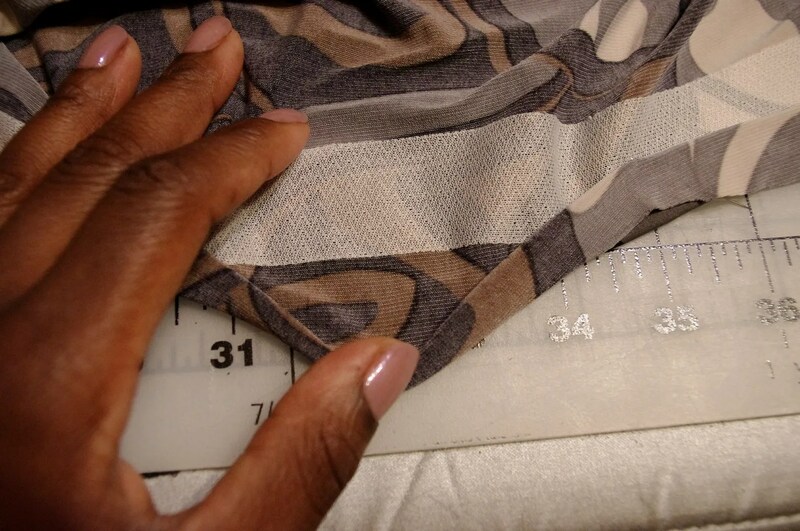 What kind of interfacing is that you used on the hem? You look great in this dress. The print and tights work well together and it looks like you will stay cozy too. I also borrowed those sleeves for my sweetheart Jalie top. I just love the extra long length of them. Ooo… another great print! I can see why you’re making so many knits with your serger back. I like this pattern too, I made it once. I like your version, it looks really cute with the tights. I always interface my hems on knits too, they always turned out great. I love the print and I love the dress. I, too, have one of these that gets dragged out every time I want comfort. I wear it short over leggings and with boots, but I really like the idea of lengthening it. Funny, that it’s such a simple idea, but I never managed to think of it myself! The long sleeve is a good idea, too and you’ve given me an idea for a knit I wasn’t sure what to do with. I will buy some of the interfacing because although I have no trouble with my twin needling, it would be nice to get rid of the tunnelling. Extremely cute, and beautiful fabric choice. Love it. great practical dress and love the way you teamed it with grey tights. I absolutely love your new dress. It is super cute! I love the style and the print rocks. Yeah! Nothing like more of an old favorite. I must say you’re more restrained than me, I’d have made 6 by now :-). love the print on this one, as always you know how to pick them. But isn’t it good to have a serger? I like wearing knits so much more, it’s something you have to have.. Cute dress and it looks wonderful with the gray tights. I do love tights. It’s a great dress! I love both looks and I’m sure it is super comfy for wearing all day. very cute… this too is one of my all time favorite Burda and I have pondered a dress (I think I have 3 tunics… all from seeing your 1 red tunic). I love the way you work with knits. This dress and the leotard in the past post -even though the fabric-drama- look fantastic. I really like this dress a lot and understand why you where it so much! You just can beat a good TNT pattern!! HAha! I love unsolicited comments about my clothes. I love your new dress. Super cute. Great fabric choice. I just hemmed a dress to roughly the same length and, being an enormous dork, I looked it up — four inches above the knee is totally office appropriate, even to stuffy people who make up the rules. You are tall, right? I think 4 inches above the knee just looks somehow higher on us tall people TO us tall people, but to the rest of the world it looks just fine. Does that even make sense? Often things that sound perfectly reasonable in my head sound like crazy talk when I write them down. Oh yes, and cute dress! 2 hours on a serger is a great investment for a dress like that. It looks really good on you, especially with that wide belt. Don’t our sergers spoil us in making things fast and well from knits? That’s the perfect 2-hour dress. Love serger projects. Another cool dress — love the simplicity of the style and the bold print. I’ve never used a serger and have been wanting to try — after seeing your wonderful knit projects done on one, I have to do it! I’ve bought that fabric in Sydney in a purple/red colourway, and made a wrap dress with it. I really like your colour combo too.